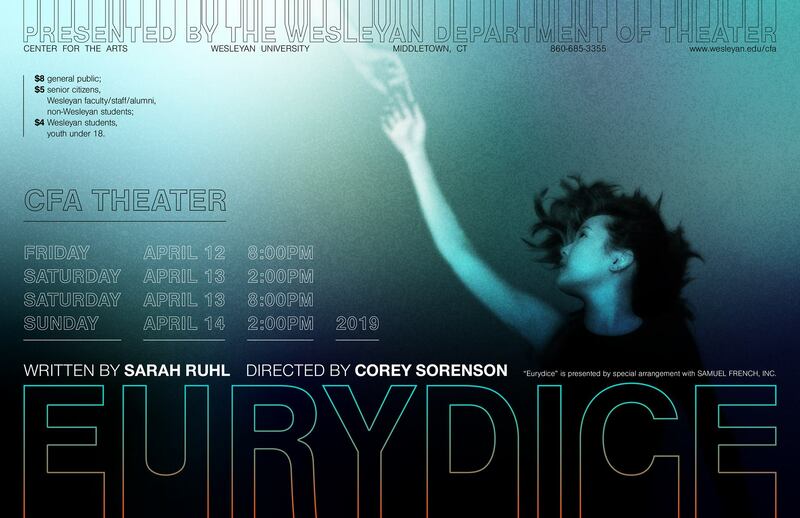 “Eurydice,” this semester’s Theater Department production, takes on the classic myth of Orpheus and Eurydice through the lens of the heroine. In content, this production shines through its different perspective on the original tale; in its production, students from all walks of Wesleyan life have joined forces to create this year’s performance. In the original myth, Orpheus falls in love with Eurydice, yet their engagement ends in tragedy when Eurydice is brought into the underworld with Hades. Orpheus descends into the land of the dead to bring Eurydice back, playing his lyre in order to convince Hades to let her go. As Orpheus’ music melts Hades’ heart, he agrees to let Orpheus take Eurydice from the underworld. There is just one condition: They must not walk side by side, but rather have Eurydice follow. If Orpheus turns around to look back to see if Eurydice is following, she will return to the underworld. Close to the land of the living, Orpheus looks back and loses Eurydice forever. “Accepting existence on its own terms” has become Sorenson’s thesis for the production, something he hopes the audience understands as the main theme of Ruhl’s work and the Wesleyan production. Students at Wesleyan have been integral in creating this beautiful production, involved in every department, from cast to crew. “One of the things that the theater department really prides is student creation and student interfacing with the making of theater at every level,” Sorenson said. Students who participate in the process receive academic credit through the theater department and are often required to be at rehearsal over five nights per week. Although students work with faculty members in their theatrical arenas, Sorenson says that students play active and important roles in each aspect of production; they’re not simply assistants or busy workers. Sorenson notes that this is in contrast to the professional theater world, where assistant directors simply sit and support the process. They act on an assistant level, completely under the control and will of the production’s main director. Beyond his assistant directors, Sorenson has enjoyed working with students across the fields at every level of production. Audiences can witness the work of Wesleyan students and faculty this weekend from April 12-14. Tickets for are available on Center for the Arts website and at the box office in Usdan. Zoe Kaplan can be reached at zkaplan@wesleyan.edu.